He stumbles down the ravine path, his scotch-stained breath billowing in front of his face. Music streams through his headphones, putting him in the front row at a personal Queens of the Stone Age concert. They’re playing Avon. It’s fitting. A bench. He’s been walking for a while, and even in his state he knows he should rest a moment. Maybe he’ll even sober up a little. The bench is a little ways off the path, but still facing it, next to a small twisted tree. As he clears the snow off the bench, he notices some cloth stuck in its low branches. It’s white, a bedsheet maybe, but still stained by mud and salt and tattered on one end. The song ends. He pulls out his headphones and listens instead to the sound of the ravine. Even on a January afternoon, the creek runs and the crows hold their territorial debates in the treetops—past that, the sounds of city life filter through to remind him where he is. It’s almost like he got written in to a pastiche of Kew Gardens. He scoffs at the comparison; he’s not interesting enough to have the likes of Woolf spare him a single thought. Only drunk on a January afternoon. The wind picks up and rattles the naked trees. Some of the crows take flight. The bedsheet flutters in the wind and it calls his eyes over, to bear witness to its struggle. The melodramatic in him might compare it to a fallen flag of a great nation, or perhaps a piece of a dress torn from a damsel as she fled some unjust marriage. Or maybe it’s a banner, marking the path for lost souls. 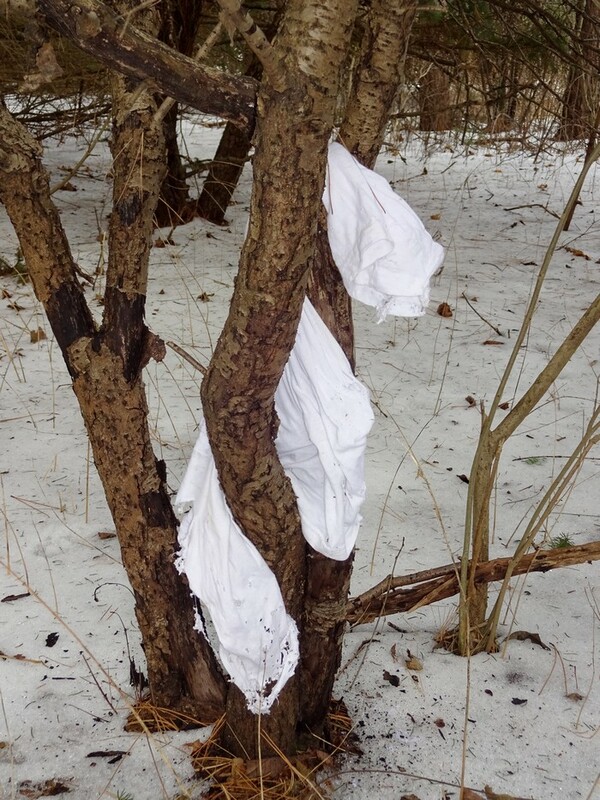 He knows it’s just a bedsheet stuck in a tree, something discarded without a thought and left to float through the world from one snare to the next. “Knowing is not enough.” The words are for no-one in particular. They just hang in the air, stuck like that bedsheet. He checks the time – time to go – and stands up. He untangles the sheet from the branches and lets it go in the next gust of wind. He knows it’ll just get stuck again on another tree, but it’s the least he could do – to help it move on to the next snare. The music starts again and he turns to carry on down his own path once more. Spencer Wiggins writes like an amateur and edits like a pro. He is currently studying at Wilfrid Laurier University in Waterloo, Canada, but originally hails from Toronto, which is the source of much inspiration in his writing. Though he prefers working in prose, he often finds himself being talked into performing at poetry readings.